Be the first to share your favorite memory, photo or story of Billie Jo. This memorial page is dedicated for family, friends and future generations to celebrate the life of their loved one. 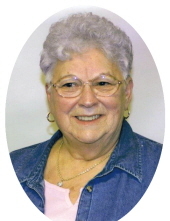 Billie Josephine Ellis Lambert, 80, of Kentre Lane, Morehead, passed away Monday, January 14, 2019, at St. Claire Regional Medical Center in Morehead. Born January 21, 1938, at Cogswell in Rowan County, she was the daughter of the late Charlie T. Ellis and Faye Reed Ellis. In addition to her parents, she was preceded in death by her husband, Vernon Raymond “Monk” Lambert, on December 7, 1996, and one brother, Hubert Elwood Ellis. Billie Jo is survived by two sons, Vernon (Melvina) Lambert of Morehead, and Robert (Teresa) Donahue of Bradenton, Florida; one daughter, Tana (Buddy) Butler of Morehead; one brother, Carlos Neal Ellis of Morehead; seven grandchildren, Tyler Lambert, Christina Lambert, Mendy Young, Crystal Cooley, Kara Donahue, Josh Donahue, and Billy Donahue; five great grandchildren, Billy and Andrew Young, Tiana Moore, and Chase and Caiden Donahue; extended family and friends. Funeral services will be conducted 2 p.m. Friday, January 18, 2019, at Northcutt & Son Home for Funerals Memorial Chapel with the Rev. Jeff Fannin officiating. Burial will follow in New Alfrey Cemetery. Pallbearers: Billy Young, Andrew Young, Buddy Butler, Josh Perkins, Gary Lanham, Danny Ellis, Tim Ellis, and Jeff Ellis. Honorary pallbearers: Timmy Thompson, Sharlet Fultz, and Bobby Howard. Visitation will be from 5 p.m. to 9 p.m. Thursday, January 17, 2019, at Northcutt & Son Home for Funerals in Morehead. To send flowers or a remembrance gift to the family of Billie Jo Lambert, please visit our Tribute Store. "Email Address" would like to share the life celebration of Billie Jo Lambert. Click on the "link" to go to share a favorite memory or leave a condolence message for the family.